S U P E R I O R P O R T A B I L I T Y . The MERCURY Kit is the perfect combination of modern innovations and advancements in vape hardware. Seamlessly integrating visually striking multi-colored resin materials within a compact pod-sized structure for outstanding portability as well as visual enjoyment. 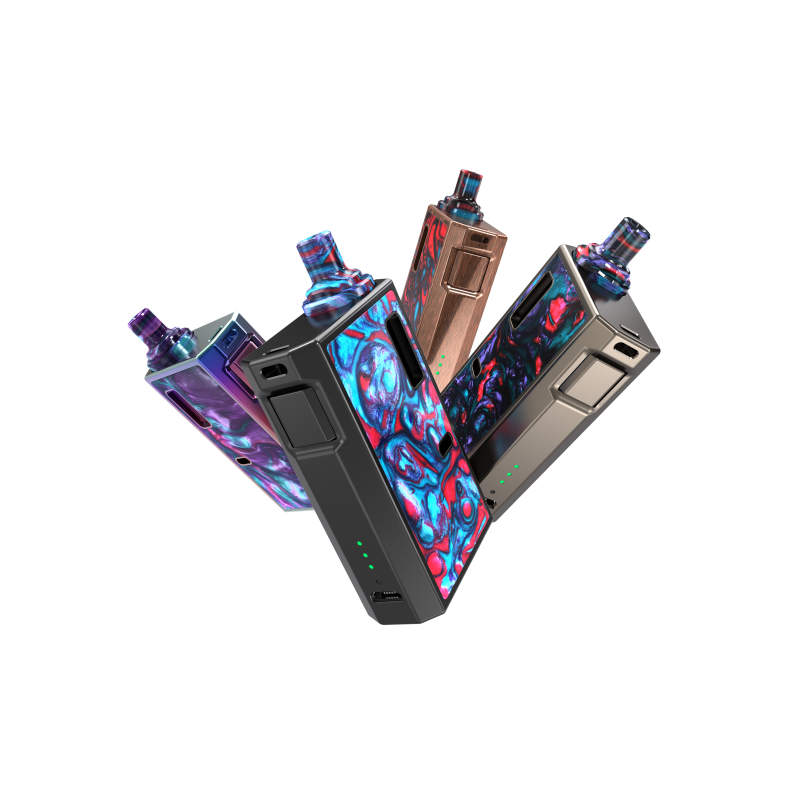 The MERCURY Mod houses a powerful 1100mAh battery that charges safely and swiftly while keeps its power for much longer with a max 12W output; Featuring an intuitive and responsive single-button firing mechanism. Presenting a highly durable exterior with high-gloss detail that resists scuffs and scratches to fully present your unique personal taste and charm. The integrated MERCURY Tank features a 2mL e-juice capacity with an easy top filling and adjustable bottom airflow design. The 1.0 ohm / 1.2 ohm coils are optimized for nicotine salt, perfectly compatible with the MERCURY battery. RESIN STRIKES AGAIN - Integrating the perfectly crafted resin materials within a compact pod-sized structure, the MERCURY puts everything you love about e-cigs into an incredibly sleek and portable design. POWERFUL, NOT POWER HUNGRY - Leave the inconvenience of frequent charging behind. With the single 1100mAh built-in battery at the constant 12W output, it will run longer than ever - even through intensive and constant use. INTELLIGENT INDICATOR LIGHTS - Featuring 3 LED lights to show you different working conditions as well as the battery life of the device. When the battery level is between 70% and 100%, 3 green LED lights turn on. When the battery level is between 35% and 70%, 2 green LED lights turn on. When the battery level is between 1% and 35% 1 green LED light turns on. HOW TO FILL THE E-LIQUID - Properly prime your coils and do not vape immediately after! After the first e-juice fill, wait 3 to 5 minutes for coil to become fully saturated before using to avoid damage to the coil. ADJUSTABLE BOTTOM AIRFLOW -The air control ring is under the cartridge for easy operation, adjustable airflow in pod. TWO COILS FOR YOU - The included 1.0 and 1.2 Ohm coils are specially designed for the MERCURY, as well as made for different concentrations of nicotine salt based e-liquid. Open-Circuited Protection - When the atomizer is open-circuited, the output is stopped and the blue indicator flashes 6 times. Short-Circuited Protection - When the output is short-circuited, the output is stopped and the blue indicator flashes 3 times. Low Power Alert - When the battery voltage is in lower power condition, the output is stopped and the blue indicator flashes 10 times to warn you of low power.